Coming to some sort of agreement around who has contact with your children after you and your partner have separated is a distinctly different legal process than the divorce process. The steps are quite similar for working out the division of property and in most instances both matters will be discussed together when you’re in court but it’s important to know that they are separate legal actions. Firstly, you need to decide if you want to go down the path of going to court or if you feel you can settle the matter out of court. If you agree on child contact arrangements with your partner, you can apply for consent orders from the court which then become legally enforceable. Since 95% of cases that are started in court finish with consent orders anyway, it would be a good idea to make an attempt towards getting some sort of agreement with your ex partner before you go to court. Even if you don’t feel like making an attempt to negotiate, the court actually requires you to do so anyway. 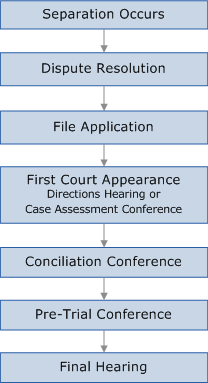 You must attend dispute resolution before filing an application and the certificate of participation in dispute resolution must be provided with your application. If no agreement can be reached, you can start court proceedings by filing an application. With this application, you will need to inform the court in writing what sort of contact you would like with your children. You may want them to live with you, but allow periodic contact with your ex partner or you may only want to see them once per fortnight for example. Note that there is a difference between contact with your children, where they spend time with you, and “equal shared parenting”. You can still be an equal shared parent but only spend time with your children every second weekend. Equal shared parenting means that you have an equal share of input into major decisions that affect your child – for example which school they will go to, which religious denomination they will be raised as (if any), and so on. If there are any immediate matters that need to have a decision and interim orders made, you will have a directions hearing (before a judge). The judge will decide how the case will proceed and will make any orders he feels are appropriate (eg. What sort of contact you will have with your children until the next court date). A conciliation conference is a required step before going to a trial and is another chance to negotiate with your ex-spouse. It is conducted by the registrar and you won’t generally appear before a judge and no orders will be made. If, after this meeting, you and your ex haven’t come to an agreement a trial date will be set (if it hasn’t already been). What sort of contact can I expect to have with my children? As with most of the questions about family law matters, the answer is “it all depends”. The main factors will be how much contact you had previously while you were still in your relationship with your ex and the age of the children. If you weren’t the primary carer and your child is very young (less than 2 years old), you may get no overnight contact and only limited daytime contact. Of course if there’s any sort of history of family violence or inappropriate behavior from either side, the will significantly affect the outcome and you (or your ex partner) may not get any contact if the court feels it’s not in the child’s best interest.